French architect Jean Nouvel (the same genius behind Louvre Abu Dhabi) just completed his prestigious project, the National Museum of Qatar. The museum takes over a sprawling 560,000-square-foot venue, which opened to the public earlier this month. The multifaceted structure is situated across the bustling Doha Corniche, the main waterfront promenade in the Qatari capital. Its design was influenced by the desert rose, a layered crystallisation of minerals occurring in salty sand. Nouvel designed 539 conical discs to act as ‘petals’, and cast them in a glass fibre-reinforced concrete, resulting in a natural flower-like formation native to the gulf region. The museum houses 11 galleries altogether (including permanent exhibition galleries and a temporary exhibition gallery), a 220-seat auditorium, 70-seat forum, two cafés, a restaurant, boutique, research centre, conservation laboratories, and a public parl. The prime jewel of the museum is the historic palace of Sheikh Abdullah bin Jassim Al Thani, which has been restored and serves as the main exhibit. At the centre of the museum is a courtyard which doubles as a community and entertainment space for outdoor cultural events. A platform is erected here, displaying the components of a traditional bait al-sha’t (or ‘house of hair’), the tents the Bedouins constructed and dismantled as they roamed the peninsula. When you enter the building, you’ll be greeted with an escalator leading up to a second lobby and corridor. Windows are set deep within the voids to minimise harsh light and heat, working with inward-slanting walls to suppress the visitor experience slightly. 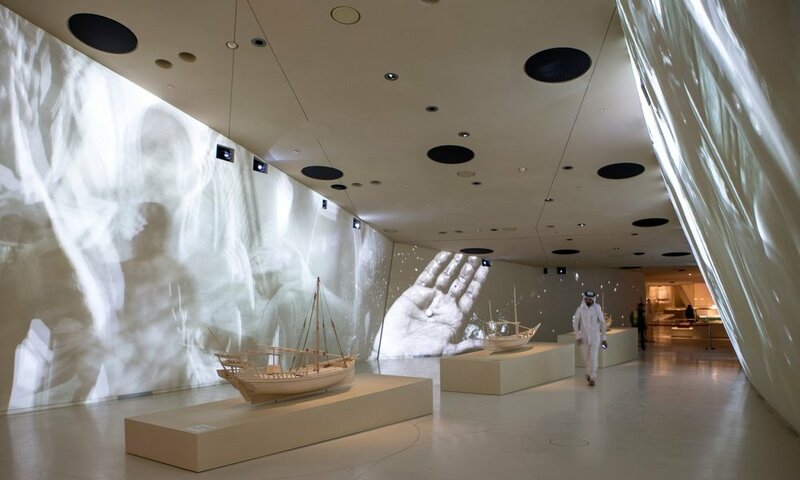 The walls give the illusion of walking through a series of Bedouin tents, displaying giant, high-definition screens broadcasting videos on loop — depicting key stages of life in the country, such as pearl divers at work, women weaving, and the process of traditional coffee-making. 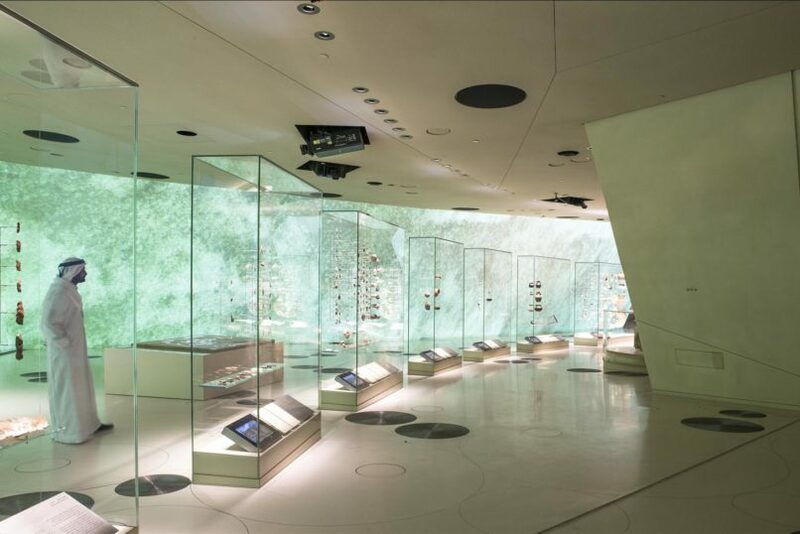 At the centre of each gallery are the actual artefacts, such as tools and runes from prehistory, falconry gear and pearl-fishing equipment from the early years of this 200-year-old nation and extraction machinery from Qatar’s recent arrival as a world leader in liquid natural gas. 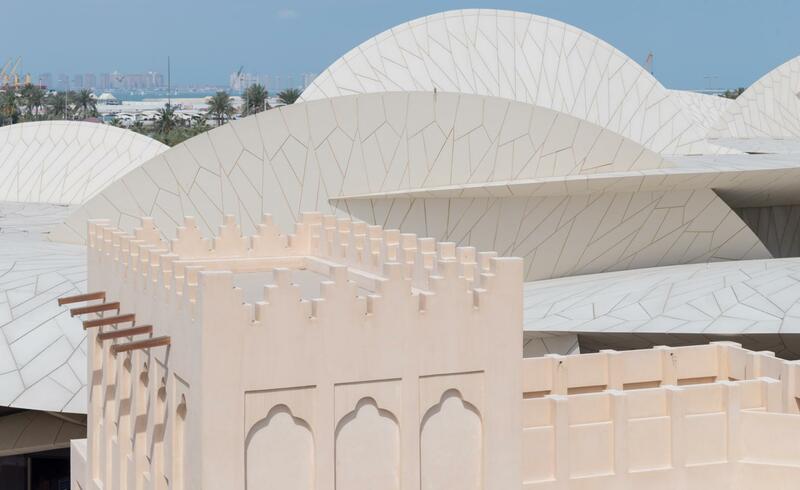 The National Museum of Qatar is open to all visitors from Mondays to Saturdays.